This is part of the remains of the massive medieval basilica. 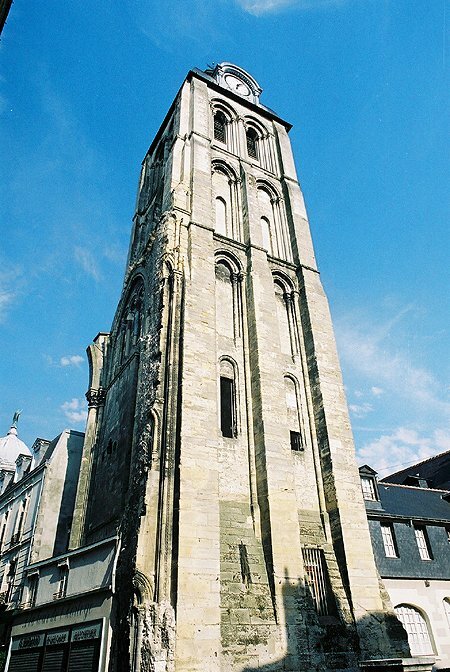 Other parts of the building can also be observed including Charlemange’s Tower. The sheer scale of this church can only be appreciated through old maps overlaid over the current plan of Tours. In comparison the modern basilica by Victor Laloux is very small. The city dates from Roman times – the name of Caesarodonum (“the hill of Caesar”) is first mentioned in the Ist century AD and was to become the chief town of the Romanised Gauls called the “Turones”. In later years, St Martin, Bishop of Tours, was widely venerated before his death in 397 and his relics then attracted such a cult that a new centre grew up around the chapel built over his tomb. The church that was later built there became a focal points for pilgrims bringing the city prosperity. From the mid-l5th to the mid-16th century, Tours became first a place of refuge for the monarchy and then the seat of its power.